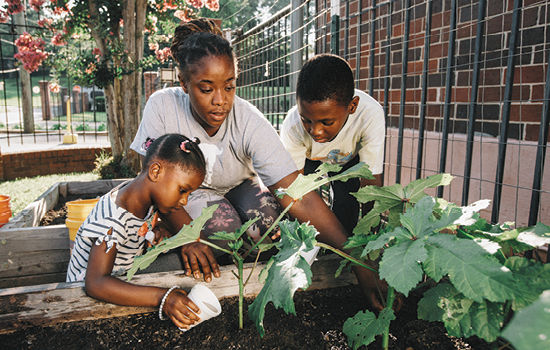 Rayonna Thompson works with her daughter, Bella, and son, Ben, in her garden plot outside her apartment in Atlanta's Westside. The garden is part of a project that received a HERCULES community grant. Six-year-old Ben pulls a plump beet from the ground. "Mom, look at this one. It's huge!," he calls. Rayonna Thompson stops harvesting green beans from the 4-ft. by 4-ft. bed to admire her son's bounty. "That one is big! Maybe we'll have that for dinner tonight," she says. Thompson took up gardening outside her Vine City apartment as part of the Garden Links Empower Neighborhoods (GLEN) program. GLEN works with low-income West-side Atlanta residents to help them plant food gardens in their yards. The goal is to give residents access to fresh vegetables, teach them about nutrition, and foster a sense of community through related events. The fledgling GLEN initiative got a boost from a community grant from Emory's HERCULES Exposome Research Center. The center was founded in 2013 to study the exposome, a relatively new concept that includes all of a person's environmental exposures over a lifetime and the body's responses to those exposures—think the environmental equivalent of the human genome. A community outreach component was built into the DNA of the center. "A goal of HERCULES is to develop partnerships with the community, so the science we conduct is both improved by the local knowledge and can be translated into community action," says Melanie Pearson, who co-leads the HERCULES Community Engagement Core with Michelle Kegler, professor of behavioral sciences and health education. "In addition, we wanted to find ways for the center to be an immediate benefit to the local Atlanta community. The grants are designed to help small community groups address the environmental health concerns in their neighborhoods." So far, 13 of the $2,500 grants have been awarded for projects including preventing non-resident waste dumping in Clarkston, identifying and documenting adverse environmental and public health hazards in the Proctor Creek Watershed, collaborating to establish a park along Peachtree Creek, and planting backyard gardens such as Thompson's in English Avenue and Vine City. In the near future, neighborhood groups that participate in a new HERCULES effort to identify exposome concerns in their communities can also apply for a $1,000 planning grant, which offers support in the grant writing process. "The goal is to not only address neighborhood environmental concerns, but also to build capacity and skills within those neighborhood groups so that they can go on to apply for larger grants," says Pearson. "We want our program to be a stepping stone." Community advocates in Clarkston championed a successful campaign for smoke-free homes. 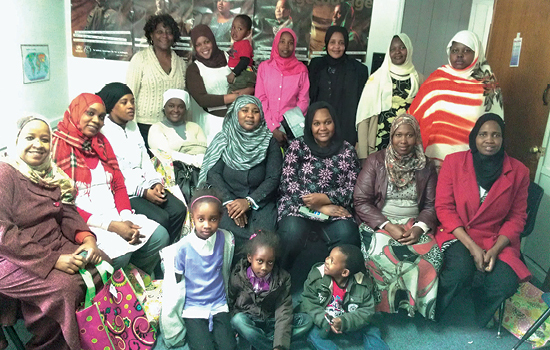 Women Watch Afrika, a social justice grassroots community-based organization working to address health disparities, received one of the first community grants. The project aims to reduce children's exposure to secondhand smoke among the immigrant and refugee community in Clarkston, Georgia, by convincing their fathers to smoke outside. "We recruited 20 women from nine different African countries who live in Clarkston," says Glory Kilanko, executive director, CEO, and founder of Women Watch Afrika. "We trained them in the health dangers from secondhand smoke, and then they went back into their communities and trained at least six other women each." Those advocates went door to door to educate other residents, in their native language, about secondhand smoke and to urge them to sign a smoke-free home pledge card. Delivery had to be delicate to convince the male head of the household in a male-dominated culture to leave his home when he wanted to light up. But the group exceeded its goal of getting 30 homes to pledge to be smoke-free, signing up a total of 51 households. 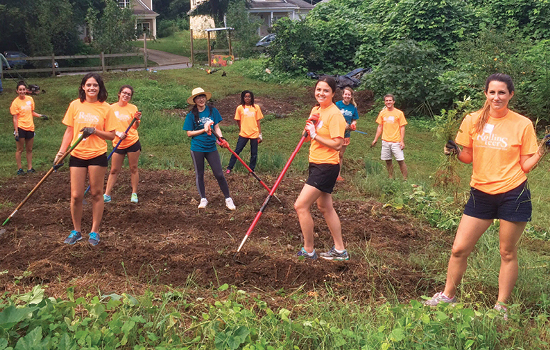 Rollins volunteers help Concrete Jungle prepare its farm in Southwest Atlanta for planting. Concrete Jungle harvests fruit from city trees to donate to food banks and shelters. Concrete Jungle used its HERCULES grant to expand its mission of transforming underutilized fruit trees and land to feed Georgia's hungry. The nonprofit relies on volunteers to map and harvest fruit and nut trees that grow untended all over the city—in yards, on the side of the road, and next to buildings. Instead of ending up on the ground and feeding wildlife, the produce is harvested and donated to local food banks and shelters that serve the city's poor and hungry. A few years ago, the founders of Concrete Jungle decided to expand the operation by starting a small farm on an abandoned lot in Southwest Atlanta. The HERCULES grant helped address naturally occurring challenges on the lot—namely a polluted creek that runs through the property and the relentless advance of kudzu, which threatens to choke out every other plant in its path. To date, the less-than-one-acre farm has produced and donated more than 8,500 pounds of vegetables. "Fruit picking is still our main program, but the farm is a nice way to keep produce donations going throughout the year," says Katherine Kennedy, the organization's executive director and sole paid employee. The grant also taught Kennedy enough about grant writing that she has been able to win more. "HERCULES was our first official grant, and it was a nice boost in our confidence and in our ability to share our story with people who didn't know anything about Concrete Jungle," she says. "I know that helped us win more grants." The GLEN program allows Westside residents such as Thompson to create small but abundant food gardens in their yards. GLEN provides the materials to build containers, supplies the soil and plants, and schools the residents on what to plant, when to plant it, and how to nurture it. It organizes classes on nutrition, cooking, and gardening without pesticides. The program also converted an abandoned lot into a hub where residents who cannot have a garden in their yard or who want more gardens can plant. The HERCULES grant allowed Historic Westside Gardens ATL, which runs the GLEN program, to add more gardens and to recruit two people from the neighborhood and train them as master gardeners so they can serve as coaches to the local growers. The coaches visit each garden once a week to help, answer questions, and offer encouragement. In addition, a monthly breakfast in the hub brings all the gardeners together to share stories and get to know one another. "We see this as a way not only to give residents access to fresh vegetables, but also as a way to build a sense of community," says Gil Frank, executive director of Historic Westside Gardens ATL. For Thompson, who had never gardened before she joined the GLEN project, gardening offers many benefits. She can feed her husband and three children nutritious, organic food fresh from the two beds next to her apartment and the four beds she maintains in the hub garden. She sells extra produce to bring in income. She has met neighbors. And she uses the time in the garden as a chance to connect with her children. "They love helping me in the garden," says Thompson. "It's a chance for us to talk and to laugh. I look at the garden as a great way to grow our relationship." As executive director of the Human Rights Data Analysis Group, Megan Price uses statistics to shine the light on human rights abuses.